Critical Volcano Monitoring Systems Returned to Operation in Alaska Resuspended Volcanic Ash from the Katmai Region to Kodiak Island Remobilized Katmai 1912 ash: community events and health hazard analysis Makushin 2015 Geology Blog Sixth Anniversary of the Redoubt 2009 Eruption Happy Anniversary, Shishaldin 1967 and 2014! New Fact Sheet on Kasatochi How big is the 2009 Redoubt lava dome? 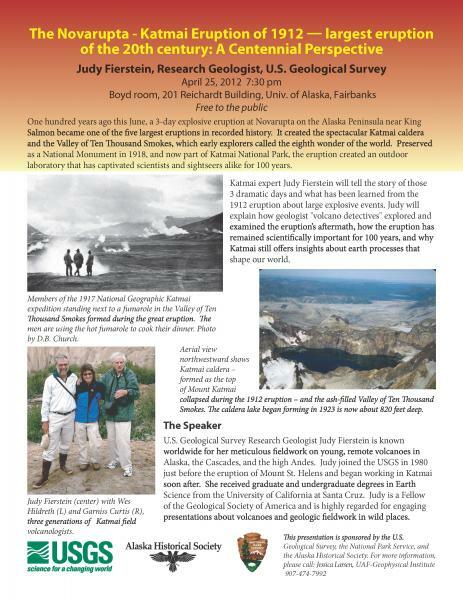 USGS Geologist Judy Fierstein will present an evening lecture at the University of Alaska Fairbanks Wednesday, April 25 at 7:30 pm as part of the centennial celebration of the anniversary of the great 1912 eruption in Alaska. The talk will be in the Boyd room, 201 Reichardt building on the UAF campus. Parking is free after 5 pm. Judy is one of the worldâ€™s few experts on the 1912 eruption and its impacts. She will present fascinating and public-oriented information based on her detailed volcanologic work in the Valley of Ten Thousand Smokes since the early 1980s.